When we invest in a Wolf oven, our first thought is often to the value it adds to our kitchen, and understandably so. Every Wolf oven is a professional-quality appliance—well-crafted and long-lasting—that will serve as an iconic and sleekly beautiful kitchen centerpiece for years to come. A well-maintained Wolf oven elevates the perception of the entire home. We may also consider the value we are adding to our meals, thanks to its impressive cooking prowess. What before was a meal that might have cost $20-30 if served in a restaurant, quickly becomes a meal worthy of whatever price you can dream up. That buys a lot of goodwill with your family and guests. But how often do we think about the investment we make in ourselves? All Wolf appliances are engineered to “ensure the dish you have in mind will be the dish you bring to the table,” no matter your skill level as a chef. The value of the confidence, pleasure and pride with which you serve up the meal of your dreams is immeasurable. Wolf ovens offer ten distinct and easy-to-use cooking modes, each of which uses a precise combination of heat and airflow to ensure delicious results, every time. If you take the time to master these support features, cooking will become a more self-gratifying journey with an even more delicious ending. So here’s your cheat sheet to the Wolf cooking modes. Wolf specializes in convection ovens, which cook food via the circulation of hot air. Wolf’s dual convection ovens have two fans in the back of the oven and four main heating elements—two in the back, one at the top of the oven (the Broil element) and one on the bottom (the Bake element). Each convection mode uses a precise combination of these elements for perfect results every time. Convection: The standard convection mode uses the dual convection heating elements in the back of the oven with alternating fans to evenly circulate heat. Cooking tips from Wolf chefs: baking larger items may take less time than anticipated, so begin checking the dish 75% of the way through the cooking time. Convection Bake: The convection bake mode uses both back convection elements and some heat from the bottom-heating Bake element. The two fans alternate on and off, spinning in opposite directions to circulate heat and maintain temperature throughout the entire oven for faster and more even baking. Cooking tips from Wolf chefs: The lower the food is towards the bottom convection element, the more it will brown. Convection Broil: The convection broil setting uses only the top-heating element to brown and sear the exterior surface of food. Both convection fans run continuously, so the heat is distributed throughout the entire oven, shortening broiling time and heating food evenly. Cooking tips from Wolf chefs: With both fans running, thicker meat heats inside to temperature before burning the outside. Brush lean meat and fish with oil before cooking to increase surface browning while keeping the inside moist. Convection Roast: With the convection roast mode, the heat comes from the dual convection heating elements in the back of the oven along with gentle heat from the top broiler heating element. Both convection fans run together to evenly distribute heat with a faster coking time. The result is tender cuts of meat with lightly browned exteriors. Cooking tips from Wolf chefs: Some recipes call for a higher temperature in the beginning and then lowering the temperature for the remainder of the cooking time. With the evenly distributed heat of convection roast, you can cook your dish at the lower temperature for the entire cook time. If you have the fancy convection modes, why ever use the standard Bake, Broil and Roast? No, these aren’t just vestigial modes leftover from an earlier form of oven, they have their own design and purpose. Bake: The standard bake mode relies on the bottom-heating element for most of the heat, with only a small amount from the top heating element to brown tops. Cooking tips from Wolf chefs: The lower half of the oven is the best place for baked goods. Broil: The standard broil mode uses only the top-heating element to brown and sear the exterior surface of food, one side at a time. 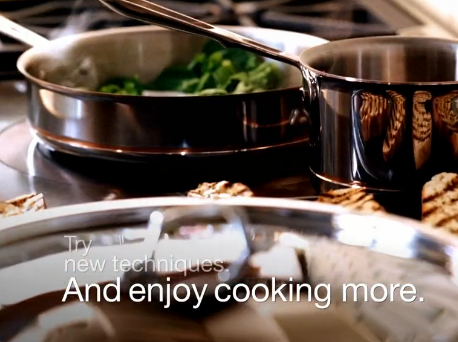 Cooking tips from Wolf chefs: For the best sear, use a short preheat time of 7-9 minutes. Roast: With the roast mode, both Bake and Broil elements are used equally. Cooking tips from Wolf chefs: The higher an uncovered item is placed in the oven, the more it will brown. For uncovered, small roasts, rack positions 4-6 are recommended. Which brings us to the remaining three cooking modes, the real specialists. Bake Stone: Requires the Wolf Bake Stone accessory. All four heating elements are used, and both fans run, to create a real “brick oven” effect. Cooking tips from Wolf chefs: The bake stone works by absorbing water from the bread dough. Only place bread directly on the stone, as other food will be absorbed, resulting in discoloration of your bake stone and lingering odors. Proof: A gentle combination of Bake and Broil heating elements is used to allow dough to rise. Cooking tips from Wolf chefs: Cover the dough with a damp cloth and keep from opening the door. Dehydration: Dehydration mode uses low-temperature heat from the dual convection elements in the back of the oven, along with constant airflow from both fans, to slowly dry out food for preservation. Cooking tips from Wolf chefs: Although Wolf ovens automatically shut off after 12 hours, Dehydration mode overrides this safety feature to ensure proper dehydration. Fairly self-explanatory, this mode self-cleans the inside of the oven by subjecting build-up in the oven to intense heat over an uninterrupted, 4-hour period. This mode is also useful for breaking in your new Wolf oven. When you first purchase your Wolf oven, you may hear cracks and pops from inside the Wolf oven. These are the sound of your oven expanding and contracting from the heat, which is normal. A round of self-cleaning mode can speed up the wearing-in process. Remember: remove all racks before activating self-cleaning mode. And don’t panic when the door locks after self-cleaning starts. If you have questions or would like a more thorough Wolf maintenance performed on your appliances, schedule a service call.